Following last weeks blog about resource recovery, I took a deeper look into the current wastewater management process and current efforts taken to incorporate resource recovery into the existing infrastructure. Taking a systemic approach, I looked into each step of the treatment process and researched what were the limitations and what future avenues of development were possible. While we are long past the days where the lack of a wastewater management system and open sewage caused a cholera outbreak in Melbourne, we are still far from optimizing it. While the shift in attitude to wastewater as a means of resource recovery is definitely a step in the right direction, there are still many challenges ahead. These issues range from policy issues to technological advancements to the profitability and cost of implementing new or updated systems. The change in perspective has been readily been taken on by the water corporation. The efforts taken by water corporation can be seen with the recent upgrades to the treatment facilities at the Beenyup advanced water treatment plant. The upgrades were made both to treat a larger amount of wastewater and to help purify it to the extent where it is drinkable echoing the changing role upheld by these facilities. But my question is, what about other resources that could be recovered and what are the challenges to doing so? Photo of Beenyup Water treatment plant, taken from here. Perhaps before even considering how to improve our current large-scale systems of wastewater treatment to better allow them to recover valuable resources, it might be worthwhile to consider how we could do so without even the use of the sewage system. What I mean by this is that there are already a myriad of options that allow for the reuse of wastewater. This includes using greywater for watering plants or implementing small internal systems within our homes capable of turning human waste from our toilets into nutrient-rich compost which can be used in our gardens. While this avenue of waste management definitely holds potential, the pursuit of this idea leads to further questions like how do we regulate self-imposed wastewater management? Or to what extent should these smaller more decentralized treatment methods be put in place? I believe that many of these questions remain unanswered and a dialogue needs to be established to effectively explore the ideas (perhaps in a future blog or vlog). But moving on from wastewater management within a small-scale contained environment, what typically happens to wastewater is that it enters the waterworks or sewage system. While I investigated potential strategies to employ resource recovery into our current networks of pipes, I quickly came to the conclusion that this was both very difficult to do and also not economically feasible. Simply said, the concentration levels of resources that could be recovered are not high enough in such a large network. After travelling through the sewage systems, wastewater eventually reaches treatment plants. This is where the concentrations of constituents begin to become sufficiently high to the point where there is some real economic value in extracting them. It is at this point where the first stage of the treatment process truly begins. This first process is called the headworks in which large solid masses (typically inorganic) and debris are removed from the wastewater via a screening process. While the captured trash is usually collected and sent to a landfill, I believe it may be possible to incorporate resource recovery into this process in the future. This could come in the form of the collection of soil particles such as sand, silts and gravels that could be treated and reused. Or perhaps instead of dumping all the trash into a landfill, it may be possible to somehow incorporate other waste (such as from bins or industrial waste) into the water treatment plants to extract valuable resources. Following the removal of inorganic matter and grit, wastewater typically undergoes primary treatment. In this treatment process, the main objective is to remove organic matter from the wastewater. Even smaller particles and rubbish are removed via sedimentation or screens and the wastewater enters primary clarifiers. It is here that most of the settleable solids settle to the bottom of the clarifying tanks and are removed. A large number of soluble solids are also removed in this process. Oils and grease also float to the top of the tanks and are skimmed off. These oils again present a great opportunity for resource recovery. In fact, funding was announced just recently to treat these oils and biosolids from wastewater treatment plants at an oil processing plant to upgrade it to crude oil and potentially diesel oil. Biosolids are also a great potential source of nutrients with evidence of improved crop yields over traditional fertilizers. However, The issue of other more harmful byproducts that may be within the biosolids warrants further investigation. Typically nutrient recovery is not utilized at this stage and is instead only utilized in the secondary treatment phase. Image depicting clarifier, for more on them check out the link here. In this phase, more biological means are employed to treat wastewater. Oxygen is pumped into the wastewater. In doing so, an idealised environment is created for bacteria and algae to feed on the remaining solids via aerobic digestion in the water to extract nutrients (phosphates and nitrates which can be very useful for fertilization but also deadly to sea life) and consume other organic solids. Secondary clarifiers are then used to extract the majority of the remaining solids as the final step to removing biomatter. After this, the wastewater is quite clean and further treatment is only needed for reuse purposed. I elaborate further on these disinfection methods in my vlog linked below. 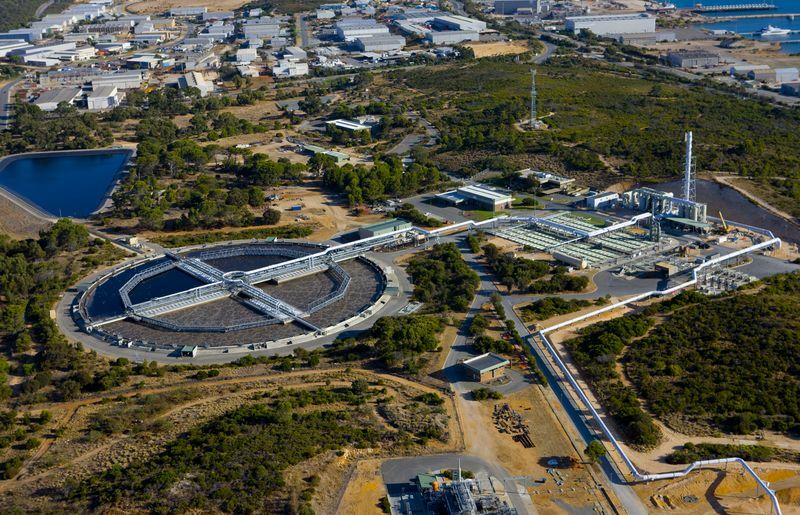 Most of the main water treatment facilities in WA are currently designed to the advanced secondary stage and I was honestly quite surprised at how much resource recovery had already been implemented especially in the secondary stage. But there was a final stage where the next step in the recovery journey could be taken. This is the employment of use of anaerobic digesters in which biosolids are left to sit in an oxygen deprived environment filled with bacteria. These bacteria produce pathogens which decompose the biosolids to produce methane and nutrient-rich digestate. Both these products are valuable resources and I look forward to how this process can be incorporated into our existing infrastructure. Perhaps one day, enough gas might even be produced to fuel the electric needs of the whole treatment facility. In conclusion, while the water treatment process seems to be ok at the moment. there are still leaps and bounds to be made to fully realize the potential of resource recovery. Hey Calvin, great blog. I thought this was very informative, and you definitely went into detail about resource recovery. loved the little drawings in your vlog too! Hey Calvin, your use of storyboard illustrations in your second vlog was genius. Such an effective and creative way of discussing how wastewater can be disinfected using techniques such as Ozone disinfection and Ultra Violet disinfection. Great stuff!! Previous Previous post: Wasted Opportunities: Brown is the new gold.